Fingask Castle is a rural and romantic wedding venue set in the heart of Scotland. We have a wide choice of locations for your exclusive wedding and reception, be it large or small, civil or religious, Asian or humanist inside the castle, inside the pavillion or outside in one of Scotland's great gardens. Come and explore this Scottish Highland castle within easy reach of Edinburgh, Glasgow, Aberdeen,Perth and Dundee. Fingask Castle provides an intimate setting for your wedding. With a private Chapel, a cosy dining room and luxurious accommodattion for your guests. Your ceremony can take place in the Castle’s Long Gallery followed by the Fountain Courtyard for drinks. Then dine in the Pavilion's Amber Room before spending the night in the Bridal Suite. Enjoy the Castle’s Long Gallery, then you can eat, dance and make merry in the Pavilion’s Amber Room which is lit by one of the largest chandeliers in Scotland and has a grand piano. Your perfect wedding can take place in our Pavilion's Amber Room or on the Castle lawns. A ceremony in the small castle chapel can be relayed to a bigger space or the gardens. We offer you an exciting choice of places to hold your ceremony: The Amber Room, one of the Castle lawns or our family Chapel with a video relay. Then celebrate in our sumptuous and spacious Pavilion. Use our glamorous pavilion for your guests to dine, dance & dalliance among the dragons. The largest party Pavilion in Scotland with a view of Fingask Castle can be tailored to fit your special day. Fingask Castle is a rural and romantic wedding venue set in the heart of Scotland. 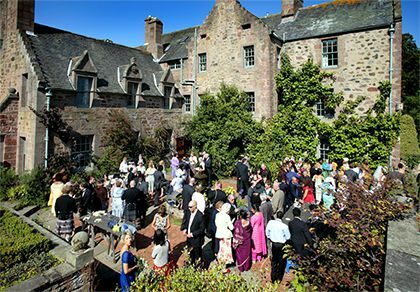 We have a wide choice of locations for your exclusive wedding and reception, be it large or small, civil or religious, Asian or humanist inside the castle, inside the pavillion or outside in one of Scotland’s great gardens. Come and explore this Scottish Highland castle within easy reach of Edinburgh, Glasgow, Aberdeen, Perth and Dundee.